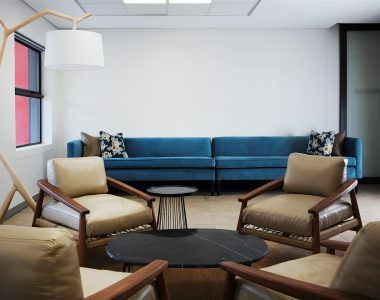 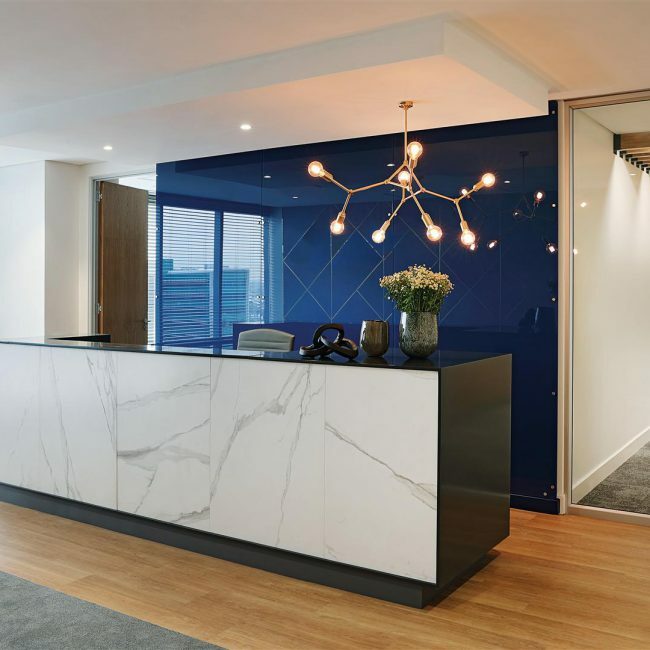 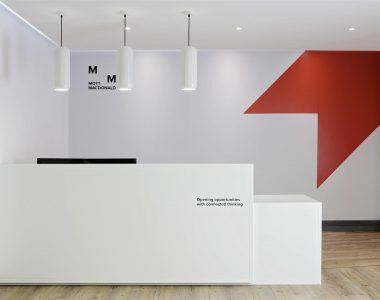 The high-end office fit-out for this global investment firm’s Johannesburg offices showcases a high standard of quality. 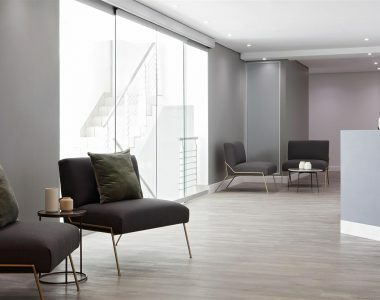 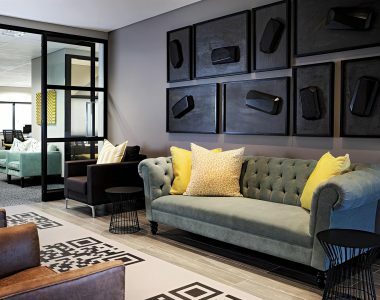 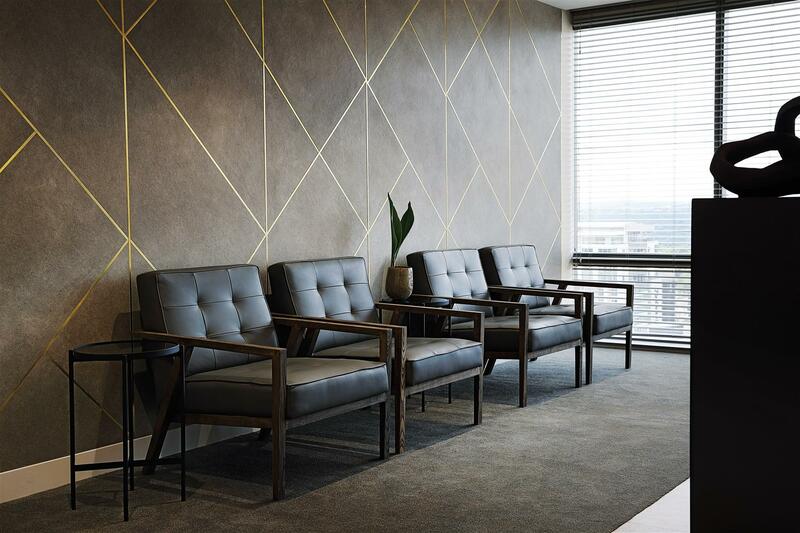 The Tétris team was tasked with ensuring that the Sandton office reflected the global nature of the business. 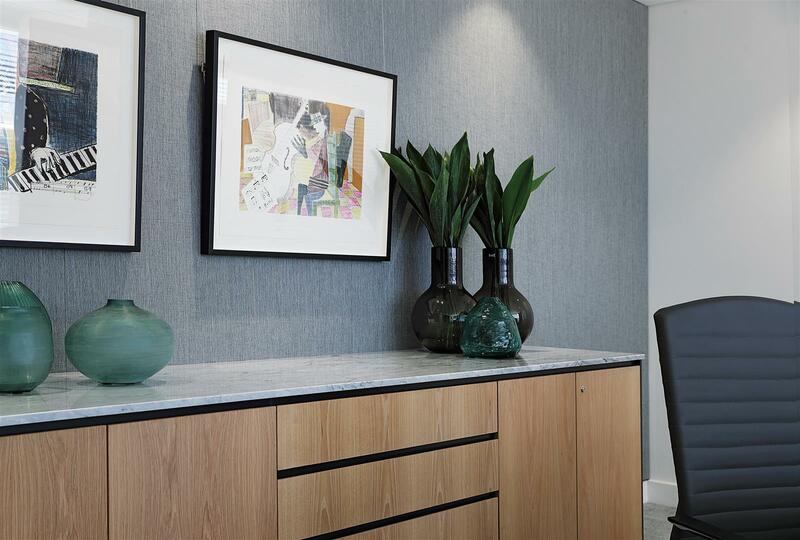 The clean lines of the reception counter showcase the Carrara marble. 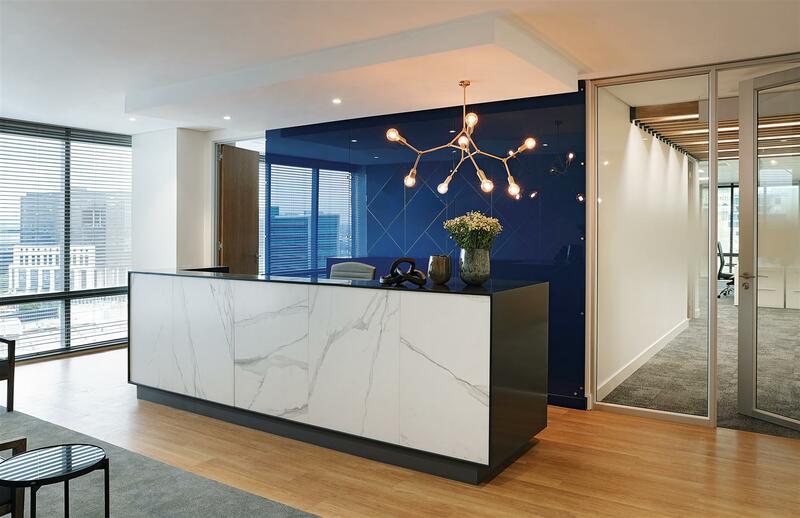 This cladding is simply framed with thin black surround, highlighting its beauty, while a blue glass wall reflects the feature light fitting. 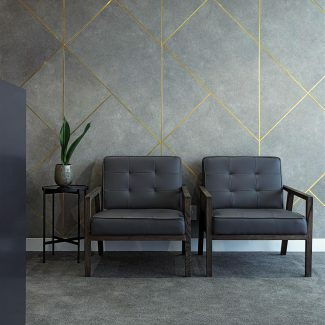 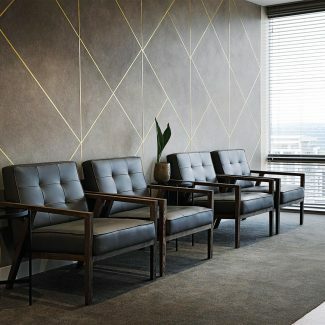 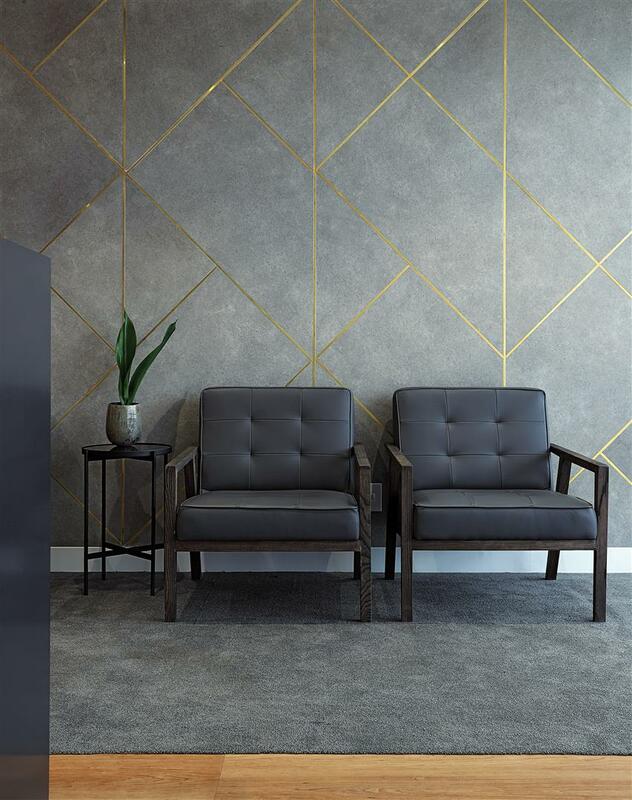 Other elements in the reception area include a dramatic tiled feature wall separated into geometric shapes by matte solid brass strips, as well as large contemporary armchairs upholstered in soft leather. 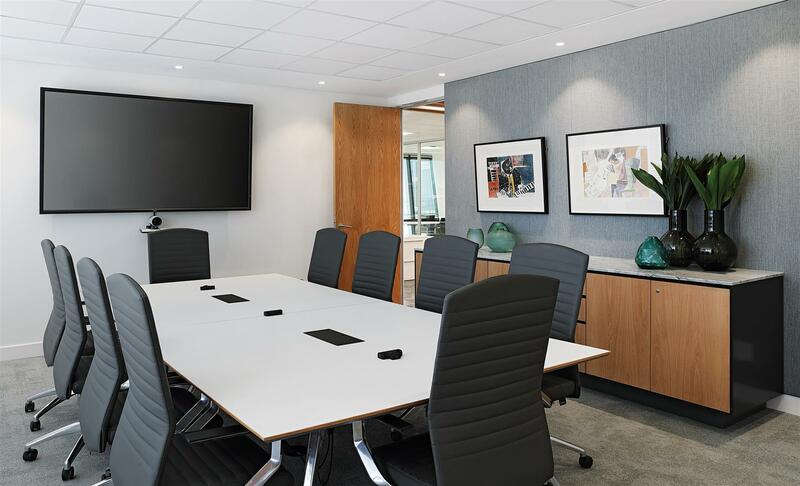 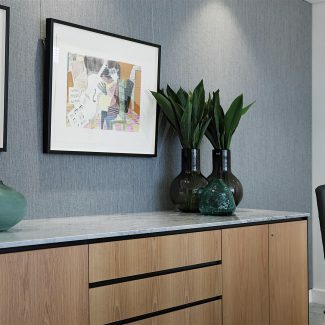 The client meeting room beyond the reception is also simple and elegant, with the choices of furniture including sculptural leather chairs and a clean and simple white meeting room table. 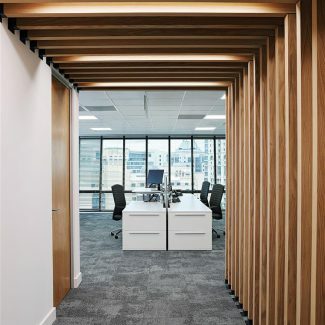 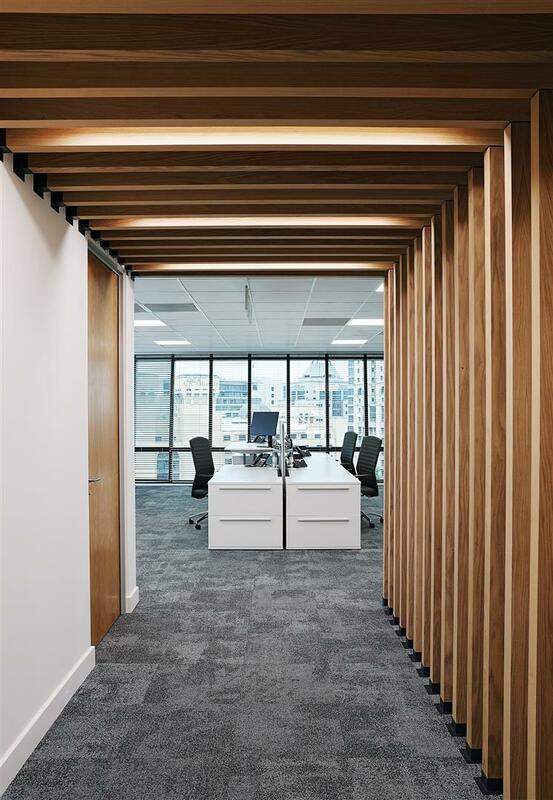 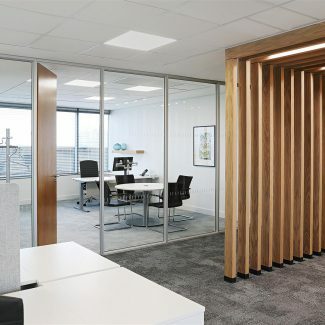 The server unit showcases a beautiful timber grain with the timber continued in a dramatic up-and-over walkway that separates the client interface areas from the general office space. 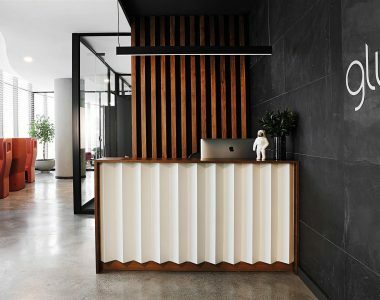 Timber slats sit side-by-side with dramatic lighting to create a striking feature in the space. 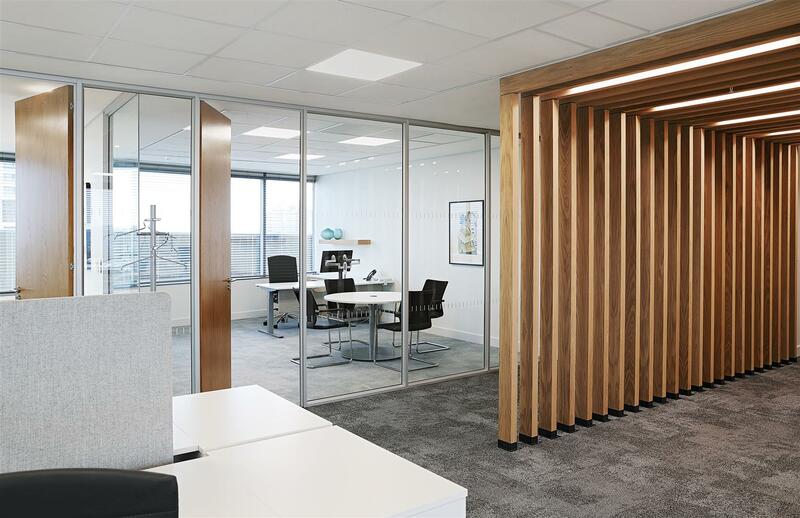 Clarity and openness are promoted with the use of clear glazing with very minimal distraction markers separating the cellular offices from the open plan desks. 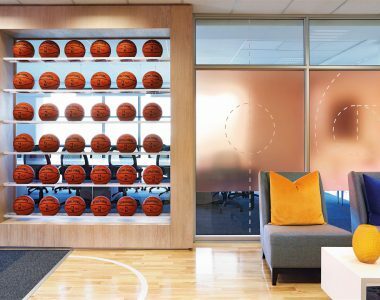 This creates a sense of transparency between managers and their teams. 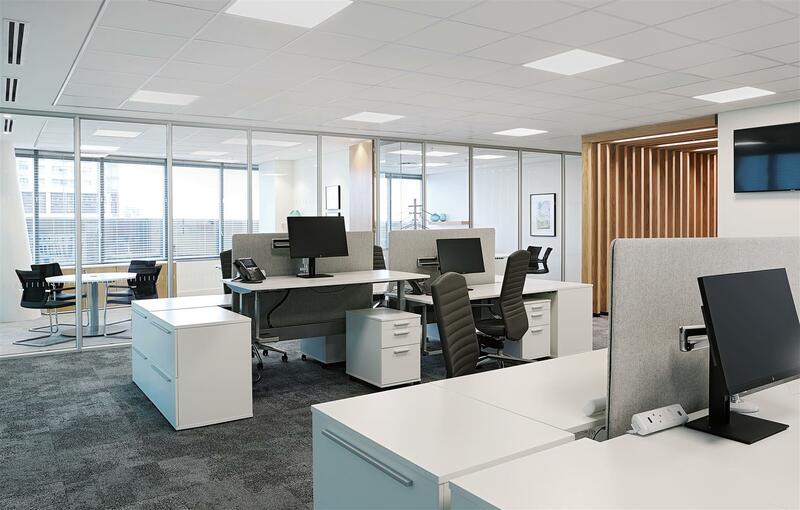 Desking was selected with simplicity in mind – white surfaces and neutral on-hand storage units contrast with the concrete-look carpet, providing texture and visual interest. 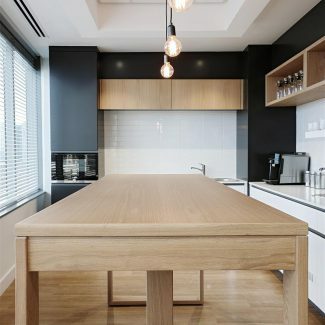 Ergonomics were very important to the firm, with high global specifications. 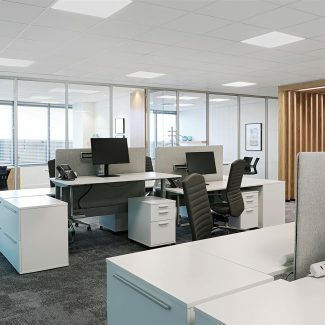 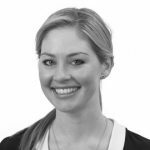 Sit-stand desks for each staff member allow for flexibility, focusing on the health and wellbeing of the people who spend the majority of their time at their desks. 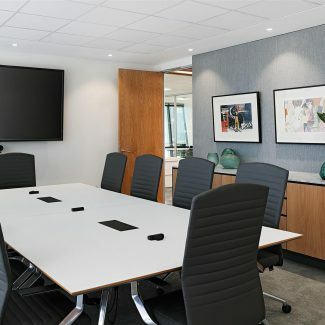 Low screens allow for privacy and help with neatness and cable management. 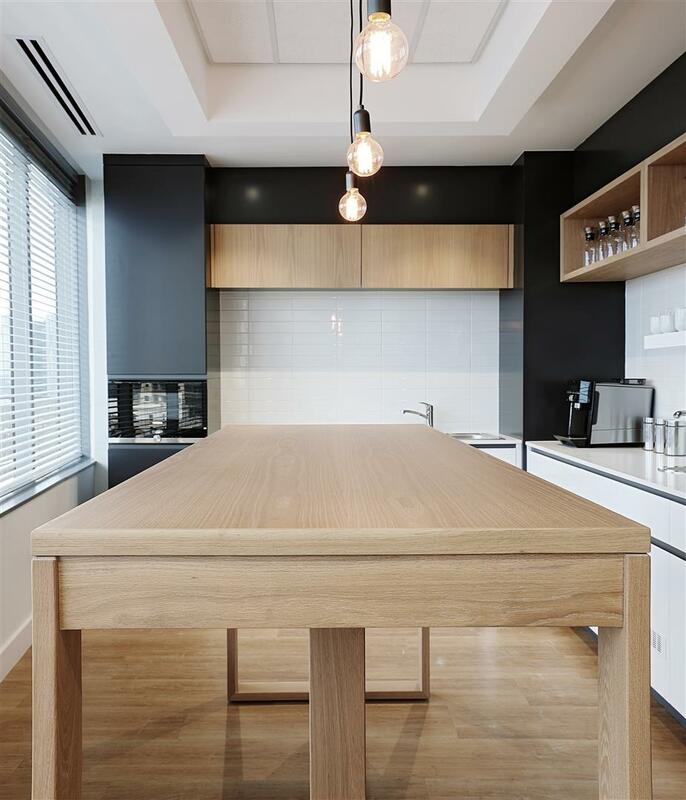 The canteen houses a family-style dining table which encourages collaboration and communication between colleagues. 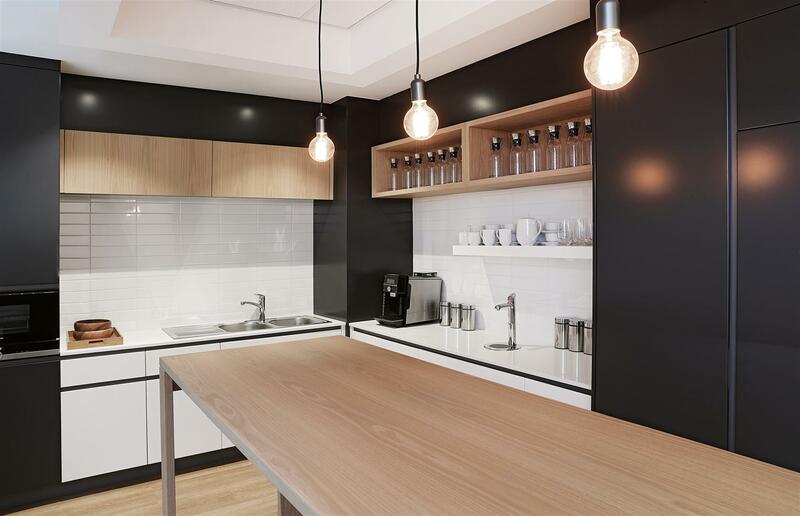 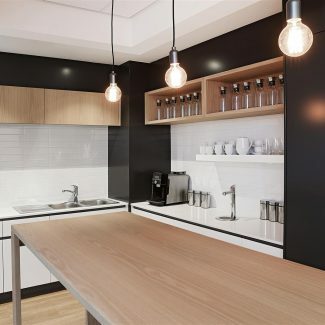 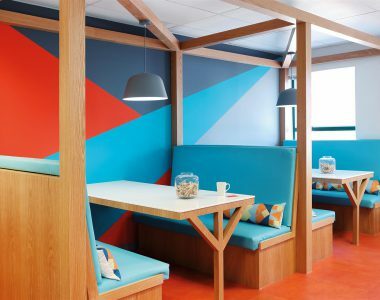 A warmer feeling in this area is achieved with timbers and warm greys – a space where staff can unwind and switch off for a moment with a cup of coffee.